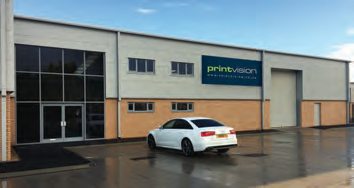 Printvision are excited to announce they are moving into a new purpose built factory, with an investment of over £2 million. The company has installed a range of new machines in their new premises, including: EFI FabriVU 340, DYSS X9 - Ultra Performance Digital Cutter, Mimaki UJV55-320 grand format LED UV inkjet printer, Monti Antonio Calender Heat Press, Xerox Digital Press, Metrix Laminator and foil machine, Duplo Cutting and Creasing machine. The Leicester based company, with a staff of twenty four, has a turnover of £2.5m. The company are a trade only supplier for all your indoor and outdoor POS Display, retail graphics, exhibition stands, design and printing services.